Alta Badia welcomes you with its pristine charm and genuine South Tyrolean hospitality. With the nature parks Puez-Odle and Fanes-Senes-Braies there are two protected nature areas in Val Badia, which every year attract hikers, climbers and mountain bikers. More than 1,000 kilometres of groomed and signposted hiking trails run through the area. The characteristic peaks of the mighty Odle massif – over 3,000 meters – and the 2875 meter Sas de Putia create a magnificent backdrop for your holiday in Val Badia. Plan de Corones is one of the most popular ski resorts in South Tyrol and is very close to your holiday region. The farm Rosshof located in the mountain village of San Martino in Badia, which is considered the centre of Ladin culture. The customs and traditions of this ancient Romansh minority are maintained in the region over generations. More than 90 percent of the locals still speak Ladin. 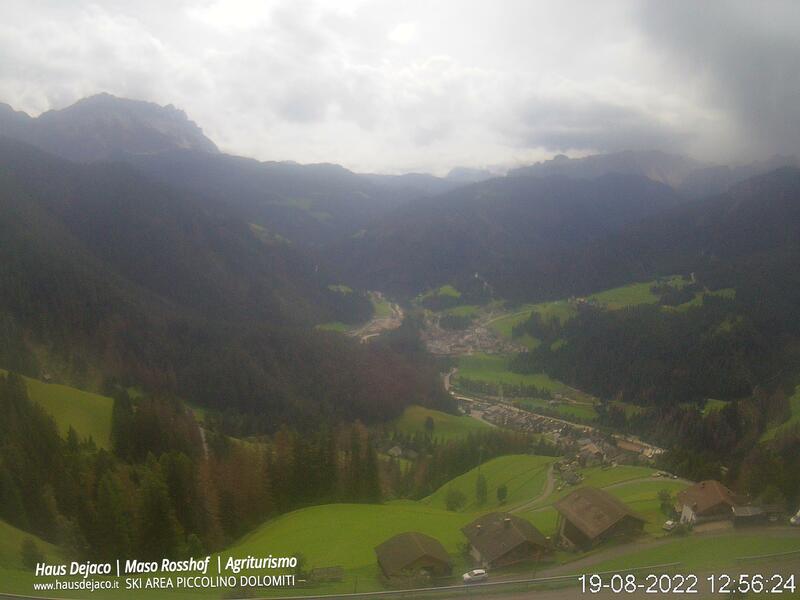 During your holiday in Val Badia you will have the opportunity to discover the Ladin history. At the Castle Thurn (Ciastel de Tor) there is the Ladin Museum, where you can get an insight into the life of the Ladins in South Tyrol. An unforgotten experience during a holiday in Val Badia is a visit to the Ladin Viles. This ancient farmstead group has been preserved in its original design over many centuries – it is almost unchanged. From San Martino in Badia you can reach the settlement on an easy hike of about 1.5 hours. In the alpine regions of Sas de Putia, Passo Croce and the Odle Group, on relaxing walks you will feel the sublime power of the mountains during your holiday in Val Badia. The farm Rosshof is located on a sunny hillside in San Martino in Badia and is an ideal base for exploring this region of the Dolomites. In summer, the meadows are covered in flowers and a fresh scent of mountain herbs is in the air. This natural experience awaits you on a hike to the top of Sas de Putia. On nine kilometres you will conquer 1,200 altitude meters before you reach the mountain peak after approx. 4.5 hours. A combination of nature and history awaits you in the Mill Valley in Longiarù. Eight lovingly restored mills are nestled in a beautiful natural landscape between the hamlets Misci and Seres.